As Barack Obama takes the oath of office today, he is in a relatively strong position heading into his second term. His job approval now stands at 52% — among the highest since his first year in office. A year ago, 44% said they approved of the way Obama was handling his job as president. At the same time, Obama’s job approval is lower than other presidents at the start of their second terms dating back to Dwight Eisenhower, with the exception of George W. Bush. 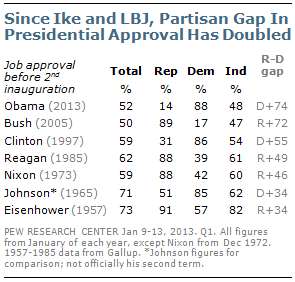 Obama’s 52% job approval is about the same as Bush’s was in January 2005 (50%). To a large extent, Obama’s and Bush’s lower approval ratings reflect the increased polarization during their presidencies (See: Partisan Polarization Surges in Bush, Obama Years).